In this fossil oak (genus Quercus) from Oregon one can see the large vessels making up the earlywood and the smaller diameter vessels arranged in flamelike patches making up the latewood. Wide, multiseriate rays cut across the growth rings. 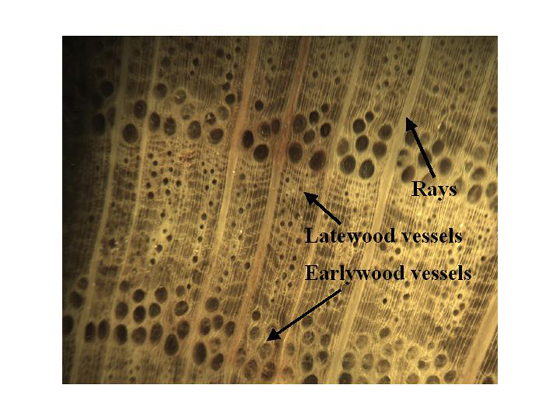 Very fine uniseriate rays can be seen in the wood between the more visible thicker rays. Vessels in angiosperms range in size from 50 to 300 micrometers in diameter depending upon the species.